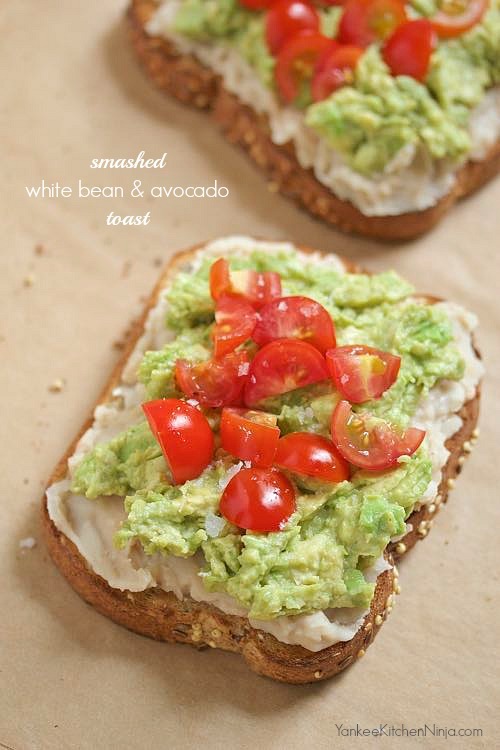 Packed with protein to keep you feeling full and energized, white bean and avocado toast is the perfect savory breakfast or easy, light lunch. It's easy to get into a breakfast rut, especially when you're in hurry, as most of us are each morning. Bless his heart, Mr. Ninj is perfectly content to eat the same egg sandwich or oatmeal smoothie that I put in front of him every morning, but I, on the other hand, need to change things up. And while baked goods like muffins are an awesome grab-and-go option, sometimes I need a savory, not sweet, breakfast. So I was pretty excited when Pepperidge Farm® asked me to come up with a healthy and delicious recipe featuring toast. Yes, toast, which, when simply buttered and served with a plate of eggs can be a little ho-hum. We all love a good slice of avocado toast, whether for a quick breakfast or an afternoon snack. I've elevated it to healthy breakfast status by adding a layer of mashed white beans, loaded with keep-away-the-mid-morning-hungries protein, and topping it all with some veggies. This, my friends, is a good-for-you, savory breakfast toast that's not only delicious but also has amazing staying power. 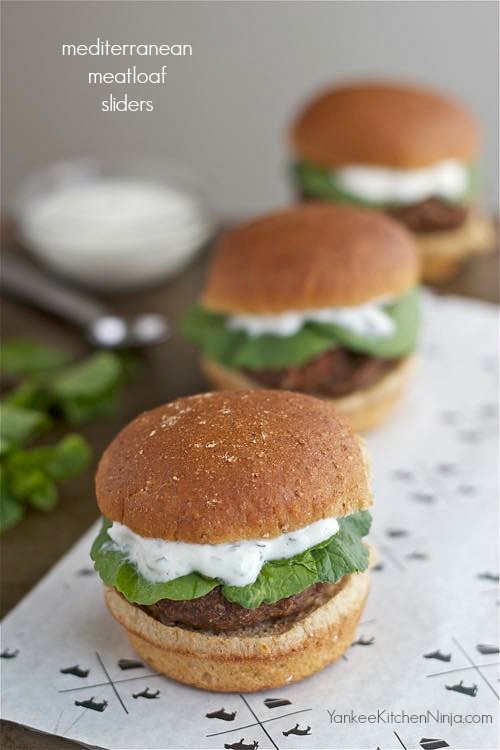 Mediterranean meatloaf sliders with mint yogurt sauce: comfort food meatloaf gets a lean, modern makeover for an easy weeknight dinner. Putting a healthy, delicious dinner on the table quickly night after night is a challenge for all of us – really, all of us: Food bloggers are no exception. While I can often solve the weeknight dinner dilemma with quick-and-easy dishes like rice bowls, soups or salads, I'm still pretty old-school about wanting to eat some protein for dinner. And by protein, I really mean meat. And by meat, I really mean beef (I have been known to refer to myself as The Meatasaurus). However, this presents me with a dilemma because one of my favorite beef dinners is meatloaf – and meatloaf is not a quick-cooking, get-it-on-the-table-fast kind of meal. And yet I do so love my meatloaf recipe, which is the one I grew up on, torn by my mother from the pages of some 1970s magazine and then customized over the years. So what's a girl to do when she wants her meatloaf but she also wants it fast? One word: sliders. Yep, because, when it comes right down to it, what is meatloaf, really, but a big burger without the bun?! 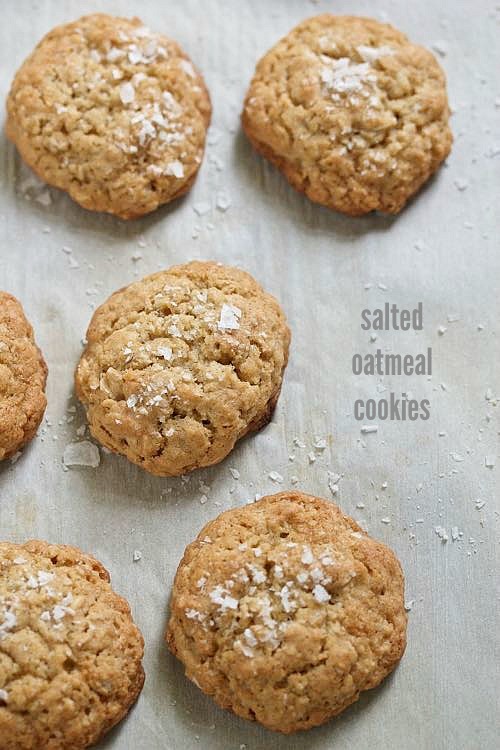 Salted oatmeal cookies, the perfect blend of sweet and savory -- there's a reason they've been dubbed 'crack cookies'. Note: Recipe and photos updated May 2016. Salted cookies sound like an oxymoron, right? Wrong. So wrong. So very, very wrong. These cookies were first described to me as "cookie crack" and I can now bear witness that that is a perfect characterization. Even though I have a bunch of healthier cookie recipes, I'm not even going to pretend that this is one of those. Yes, there are oats in it but there is also a crapload of butter and sugar which cancel out the oaty benefits. But you will not care. The balance of savory/sweet is absolutely perfect. You cannot eat just one. Hellz, you can't eat just six! So please do not waste these on children. Repeat: PLEASE DO NOT WASTE THESE ON CHILDREN!